Limited edition of 300. 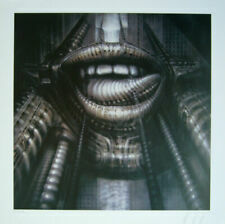 Hand signed and numbered personally by Giger in black grease pencil. Hand signed and numbered personally by H.R. Giger (the Oscar-winning designer of Alien). Limited edition 145/495. NEW with creased lower left corner border from storage handling. High quality print that is great for both regular and blacklight viewing. #9 “The Practical Deception” (size 22” x 34”). 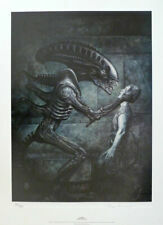 Dramatic fine art print from ALIENS-EARTH WAR, by renown comic artist John Bolton. Printed in 1991 by Dark Horse. 19.5" x 27". Wonderfully surreal painting from the Star Wars universe by Jota, in a beautifully illuminated, Dali-esque style. This is an over-painted, unique canvas gicle'e 1/1. Jota works over the print in acrylic paint, making it a one of a kind work of art. 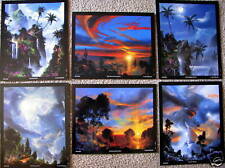 SIX - DALE TERBUSH art prints. -THE COLOR OF RADIANT HEART. Continental U.S.A. only. SIGNATURE ON THE PLATE (PRINTED SIGNATURE). -TWICE TOLD TREASURES. -WHEN YOU SEE A SIGN FROM HEAVEN. Numbered from alimitededition of 500. Image m easures 22" x 17". Produced on archival quality paper. Masterfully rendered depiction of Mike Mignola's Hellboy by artist Wayne Barlowe. The HELLBOY limited edition print is personally signed by Wayne Barlowe and Mike Mignola. Wayne Barlowe was commissioned by director del Toro to put his adept brush to Mike Mignola's HELLBOY. #13 “The Relentless Predator” (size 22” x 34”). De Es Schwertberger - Popular Viennese Fantastic Realest who studied under Ernst Fuchs. De Es' art book is HEAVY LIGHT. Litho Is Personally Signed And Numbered By De Es in pencil. This litho is in UNSOLD condition. Hand signed and numbered personally by H.R. Giger (the Oscar-winning designer of Alien). Limited edition of 495. De Es Schwertberger - Popular Viennese Fantastic Realest who studied under Ernst Fuchs. De Es' art book is HEAVY LIGHT. Original Zink Plate Lithograph signed in pencil by De Es. Litho Is Personally Signed And Numbered By De Es in pencil. High quality print that is great for both regular and blacklight viewing. DAEMON Print by Giger Signed limited edition of 300 Archival paper. Limited edition of just 300. Hand signed and numbered by Giger in black grease pencil. De Es Schwertberger - Popular Viennese Fantastic Realest who studied under Ernst Fuchs. De Es' popular art book is HEAVY LIGHT from Morpheus Fine Art. This is just 14 of 150! De Es Schwertberger 'Balance' limited edition print/signed! This is #135. Signed in pencil on white border. 4 ASSORTED MARTIROS MANOUKIAN FINE ART SERIGRAPHS ON PAPER. THEY ARE REAL OVER RUNS SAMPLE PROOFS IN NEW CONDITION, NOT SIGNED. THE VALUE OF THESE PRINTS ARE FOR DECORATIONAL PURPOSES ONLY. HE LIVES NOW IN THE UNITED STATES. High quality print that is great for both regular and blacklight viewing. #6 “Weapons of Choice” (size 23”x31”). High quality print that is great for both regular and blacklight viewing. #4 "Superfical Diversion" (size 23”x 35’). Personally over painted in acrylic by Jota! Jota's first book, ABOUT FACE was release in 2015, and his first Museum exhibition was this year. Only needs to be stretched--framing is an option. Salvador Dali(Spanish,1904-1989):Don Quixote. 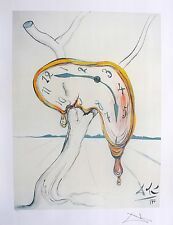 This fantastic print features a famous work by Surrealist Master Salvador Dali. Facsimile printed signature. Pencil numbered edition of 500. Condition: Excellent. Max Papart (French, 1911-1994) Max Papart was born in Marseilles, France in 1911. Papart began his career as a landscape painter. His work evolved into abstraction, and he gained a reputation as the heir to classic cubism. Artist : Ali Akbar Sadeghi. Persian Painting Art Print "Traditional Tea House" Kerman / Iran. Original work : Watercolor. Subject : Traditional Tea House - Old public bath house converted to a Tea House. Title-Glass Tears for The Radical Eye Exhibition. Artist-Man Ray. Marks-Relevant Data on Bottom. The Confederates closest to us are the 18th Mississippi, of Barksdale’s Brigade; beyond them are the Georgians of Wofford’s Brigade. The smoke we observe in the distance, from behind the trees just beyond and to the left of the wood-sided canning house is from the guns of Patterson’s Confederate Battery. Bedlam In The Brickyard - Gettysburg. Now they face a war of survival in Confederate prisons. Title-Woman with Black Mask or Noire Et Blanch. Artist-Man Ray. DOUBLE MATTED ON PAPER. SHRINK WRAPPED. OPEN EDITION MINI PRINT. IMAGE SIZE 10X8. Salvador Dali (Spanish 1904-1989). Printed in Switzerland 1993. Rare and Out-Of-Print. Persian Painting Print Copper-smiths Bazaar in The City of Kerman/ Iran - by Sadeghi. Subject : Coppersmiths section of Kerman Bazaar in Iran. Title : Coppersmiths Bazaar. Original work : Watercolor. SOLARIZATION-SLEEPING JULIET. Highly suitable for framing. Lithographically reproduced from 1931 original. We Gained Nothing But Glory - Gettysburg. It is 2:30 pm on July 3rd, 1863, and it is hot, nearly 90, and the humidity is smothering. General Richard B. Garnett, commanding the First Brigade in Pickett¡¦s Division, is clad in an overcoat to fight off the chills. 'DIPINTO,1954'. RARE 1997 ART PRINT. Year printed:1997.